Adding a virtual storage appliance (VSA) to your VMware infrastructure enables you to take full advantage of technologies like VMware High Availability and VMotion. 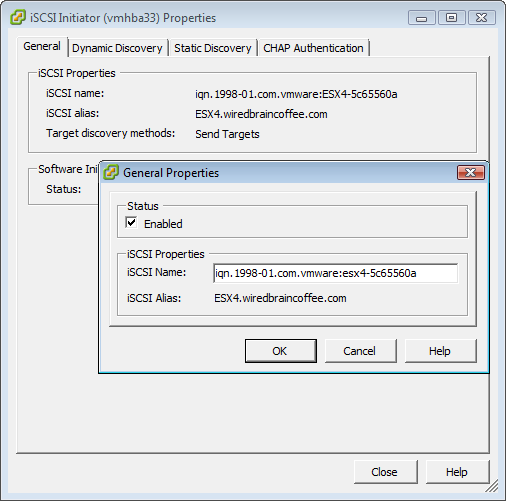 Get step-by-step instructions to connect ESX Server with LeftHand Networks' iSCSI SAN. To fully exploit the technology in VMware High Availability, VMotion and Distributed Resource Scheduler (DRS), you need virtual storage. LeftHand Networks' virtual SAN appliance (VSA) enables you to cluster VMware ESX Server internal disk capacity across several hosts and manage it through ESX Server and is the first virtual storage appliance listed in VMware ESX's SAN Compatibility Guide. Previously, I explained how to install LeftHand's VSA and set up ESX Server to work with the VSA storage area network (SAN). 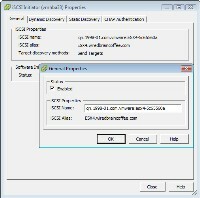 Next, click on Storage Adapters in the Hardware menu box, find the iSCSI Software Adapter and click Properties. Click on Configure, check the Enabled checkbox under Status, click OK, and then click Close. 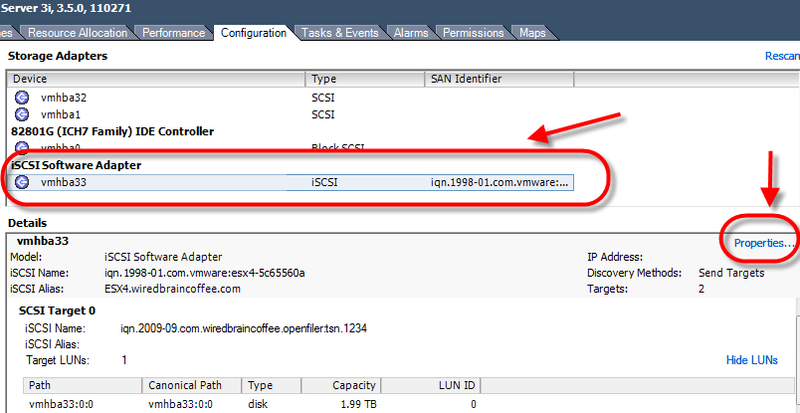 In the iSCSI Properties window, click on the Dynamic Discovery tab. 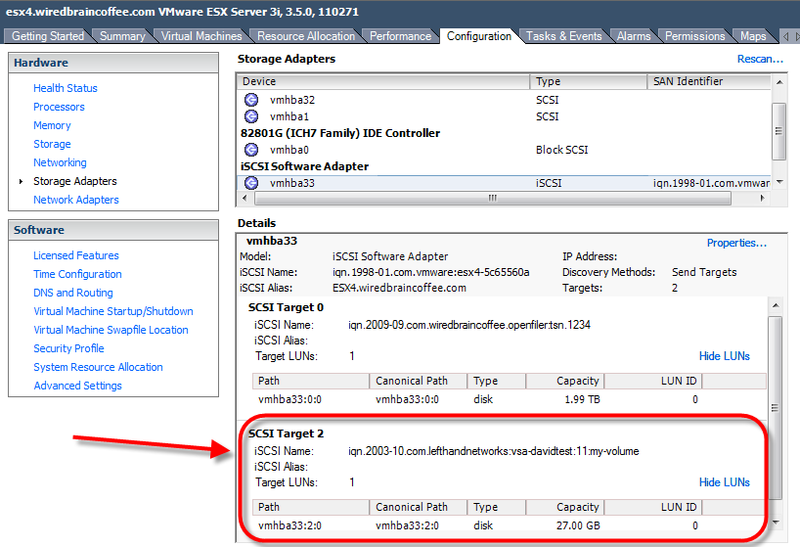 Click Add to add a new iSCSI target. Enter the IP address of the VSA cluster -- not the VSA server -- and click OK, then Close. 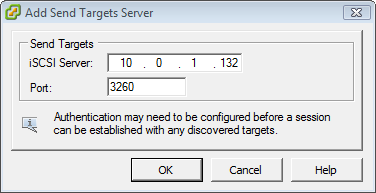 Re-scan the iSCSI targets. Now go return to the Hardware menu box in the VI Client and open Storage Adapters. You should see the new LeftHand VSA iSCSI volume (see below). Note the 27 GB volume that we created from the 30 GB volume we had created in VSA. Finally, go back to the Storage configuration settings and click Add Storage. Choose to add a new disk/LUN and select the new VMware host bus adapter (VMHBA) associated with the LeftHand VSA. Give the new data store a name and click OK. After a few minutes, the new VSA data store will be ready for use. At this point, you can either use Storage VMotion to move existing virtual machines to the new iSCSI SAN or create new VM guests on the iSCSI SAN. Now you're off and running with LeftHand Network's VSA. There is a lot more to learn, however. I encourage you to continue your education by reviewing the following resources. VMware Site Recovery Manager book. 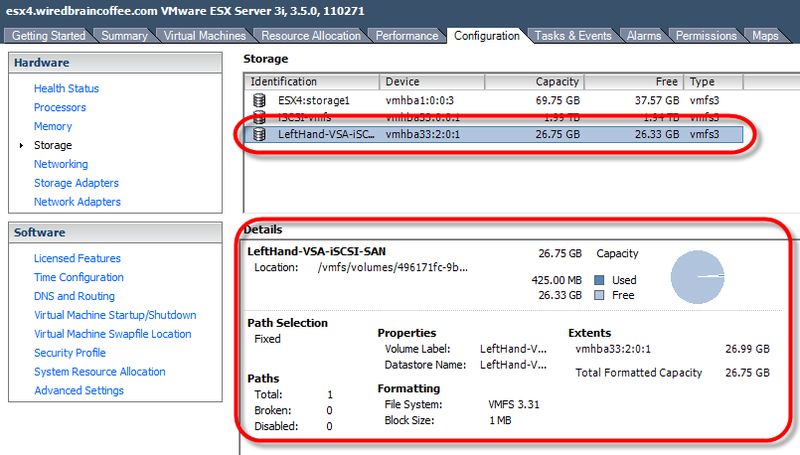 Video: VMware SRM – SAN Setup using LeftHand VSA. ABOUT THE AUTHOR: David Davis (CCIE #9369, VCP, CWNA, MCSE, CISSP, Linux+, CEH) is the Director of Infrastructure at Train Signal, Inc. He has written hundreds of articles and six video training courses. His websites are HappyRouter.com and VMwareVideos.com .